Before Rachel Brem had reached her teenage years, her mother was diagnosed with breast cancer. As she later recalled, “I just decided that I would do everything I could to attack the disease in the most positive ways. 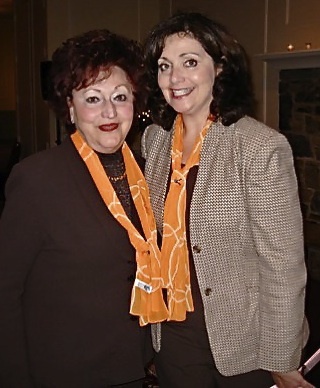 It was a commitment I made as a young girl and I followed through in college and then at medical school.” Fortunately for Brem’s mother, the cancer was diagnosed early enough and she was treated successfully (see photo below right of Rachel with her mother, Lea Frydman, in 2010). For the past twenty years, Dr Rachel Brem has dedicated herself to the advancement of technologies for the early diagnosis of breast cancer. In 2005 she established the Brem Foundation with a mission to advance patient care and research and, ultimately, to “defeat breast cancer.” As the Radiological Society of North America (RSNA) gears up for its centenary celebration in Chicago this weekend, Brem and a group of international breast imaging experts have just published a landmark paper in Radiology. Known as the SomoInsight Study, this was an observational, multi-centre project in which 15,318 women who had either heterogeneously dense or extremely dense breast tissue were enrolled. Participants underwent full-field digital mammography (FFDM) followed by automated breast ultrasound (ABUS), with the results being interpreted sequentially. A total of 112 women were diagnosed with breast cancer, 82 using FFDM alone, and another 30 with the addition of ABUS. Interestingly, 93% of the additional cancers detected with ABUS were more serious, leading Brem to conclude, “These are the ones we want to find: small, largely node-negative, and invasive.” There was one negative outcome, however: the number of false positive findings increased with the addition of ABUS, the authors attributing this finding to the assimilation of a new technology.